When people die during wars or disasters, or while migrating, their bodies must be handled respectfully and with dignity; and the remains of unknown individuals must be searched for, recovered and identified. Humanitarian work has come to include these tasks, for which forensic science offers matchless tools and expertise. Locating and analyzing human remains can be difficult, especially when bodies have been buried in secret graves; when the number of unidentified remains is in the hundreds or more, analysis and identification are made even more difficult. The ICRC provides advice, support and training to local authorities and forensic practitioners in searching for, recovering, analyzing, identifying, and managing large numbers of unidentified remains in varying states of preservation. Even where forensic facilities are highly developed, this is often beyond the capacities of local authorities and forensic practitioners. The ICRC focuses on building sustainable local forensic capacity, as external assistance may not be available for the duration of such projects, which can span decades. The ICRC also promotes the use of scientific best practice and the provision of necessary training. 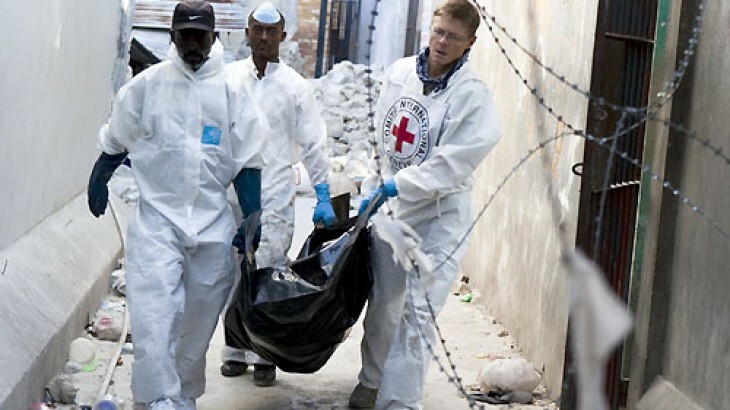 The ICRC’s forensic services are adapted to needs, and constitute a part of an integrated approach to humanitarian action that includes such matters as protection activities, legal guidance, psychosocial support, health services, economic assistance, access to water and suitable habitation, and reducing the humanitarian impact of weapon contamination. Under international humanitarian law, the remains of people who have died during armed conflict must be handled with dignity and properly managed. However, in conflict situations, it is often not possible to promptly recover or properly manage the remains of those who have perished, both civilians and soldiers. In many instances, individuals have been separated from their families, have disappeared or have died without being identified, and the whereabouts of their remains are unknown. There is a growing demand for forensic expertise, including that of the ICRC, among State authorities and local practitioners, who need this expertise to fulfill their obligations under humanitarian law with regard to the management of dead bodies and the provision of information to bereaved families. In the Caucasus, the ICRC helps the families of missing persons to meet their legal, economic and psychosocial needs. At the same time, the ICRC works with authorities to build the necessary forensic capacity and develop mechanisms for improving communication, cooperation and coordination between actors mandated to clarify the fate of missing persons. After a disaster, natural or man-made, the remains of the deceased must be collected in a timely manner, properly managed and, ideally, identified. This is vital for the families and communities affected. When local infrastructure has collapsed, it can be particularly challenging. The ICRC provides material support, as well as advice and training, to local authorities and first responders for these purposes. The training and advice provided by the ICRC enables first responders to gather and record information that will increase the likelihood of identifying the dead. The knowledge that the remains of their loved ones have been properly handled, and accorded the dignity that is due them, may also be a source of solace to families. In Nepal, the ICRC works with first-aiders, the Nepalese Red Cross and national authorities to enhance disaster response and develop sustainable capacity, including in the management of human remains. Migrants who die along migratory routes often remain unidentified and the task of managing their remains can overwhelm local forensic facilities; As a further consequence, the families of the victims do not know the fate of their loved ones, and thus cannot recover their remains and mourn their death. The ICRC works with local authorities and forensic practitioners to develop standardized procedures and protocols, and to improve communication and cooperation strategies, for dealing with this issue. In Mexico, the ICRC and the Mexican Red Cross help to provide protection and assistance – basic medical services, access to water and sanitation, and services for reuniting families – to migrants originating in or crossing through that country. The ICRC also works with Mexico’s national medico-legal services to develop domestic procedures and protocols to improve the management and identification of remains, including those of migrants, in order to help provide answers to their families.